It’s Christmas week, and we can’t wait to see you! we are stocked up with special items you won’t find anywhere else. Please let us know what treats we can help you find, and follow us on Facebook and Instagram to stay abreast of winter delicacies as they arrive! Shopping for a cheese lover? Ask us about our Monthly Cheese Lover’s Club! We’re currently accepting members for January through March, 2018. Pay up front, and receive a beautiful selection of cheeses and accompaniments, themed around certain flavor profiles, regions, or styles. Tasting notes and wine pairing suggestions are included! For more information, please stop by The Shop or call us at 978-369-5778. To order, please call us at (978) 369-5778. We request at least 48 hours’ notice. Cheese Platters – A selection offour to six perfectly aged international & domestic cheeses beautifully garnished and served with an assortment of bread and crackers $6 p.p. 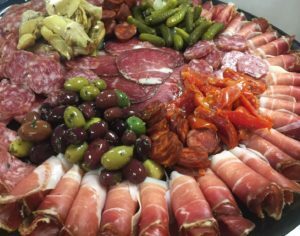 Charcuterie Platter – A hand picked selection of four to six different styles of dry cured meats from around the world served with cornichons and an assortment of bread & crackers. $6 p.p. Antipasti Platter – A delicious selection of different styles of antipasti served with an assortment of bread & crackers. $6 p.p.